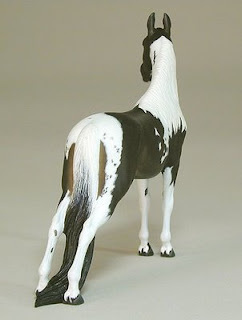 Her hooves are of note as they are black hooves on a tobiano pinto. This is possible because of the extreme ermine spots. 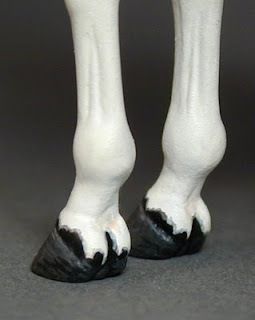 My filly has hooves and markings just like this. It's always fun to paint a few of my newest resin release before I begin a new scupting project. I love pintos, appies, dapples, but there is something so elegant about a simple color. It doesn't compete with the sculpture and shows off the underlying structure in a way that the 'hey, look at ME!" fancy colors don't. 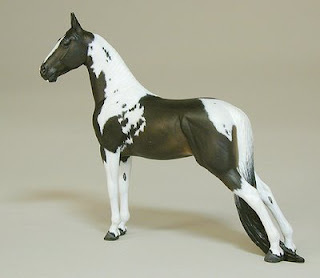 Most real horses come in 'plain Jane' colors, but are still beautiful. 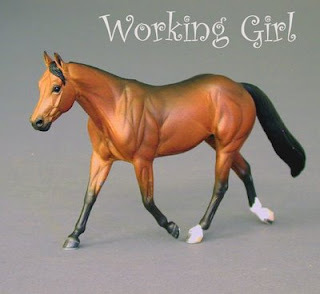 I handpainted my Working Girl in oils, which I prefer. For me it is easier to get a rich, luminous, and controlled final product using them. 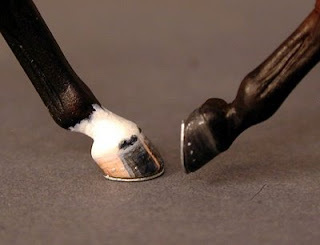 I used to do all my paintwork with an airbrush, and got pretty good at it, but once I begain using oils my airbrush was, for the most part, stashed away. I envy those who are masterful with the airbrush, especially as I wait, and wait, and wait for my oil paint to dry......!!!! I'd love to paint up a few more, but might not have the time. 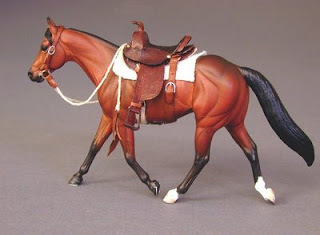 The next sculpture is awaiting me, spring has spring as well as the weeds, and the real horses need to be ridden. I'd have some much more time to devote to my art if I lived in a condo......hmmmmm........NO!